#1 New York Times bestselling author Jonathan Kellerman is the unequivocal “master of the psychological thriller” (People). Tanya Bigelow was a solemn little girl when Dr. Alex Delaware successfully treated her obsessive-compulsive symptoms. Now, at nineteen, Patty Bigelow, Tanya’s aunt and adoptive mother, has made a deathbed confession of murder and urged the young woman to seek Delaware’s help. Armed with only the vaguest details, Delaware follows a trail twisting from L.A.’s sleaziest low-rent districts to its overblown mansions, retracing Patty and Tanya’s nomadic and increasingly puzzling life. Then a very real murder tears open a terrifying tunnel into the past, where secrets–and bodies–are buried. 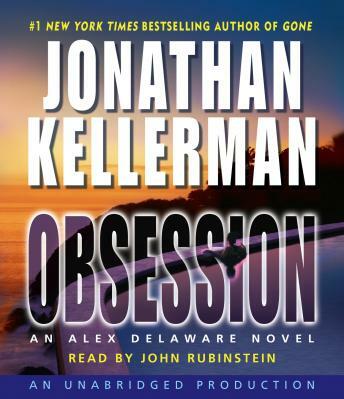 Dramatic, action-packed, and filled with the psychological detail that only Jonathan Kellerman can provide, Obsession is a whodunit, a whydunit–and something unique: a did-it-even-happen? This is Kellerman at his heart-racing best.